No matter how young or old you are, where you hunt, whom you hunt with or what kind of place serves as your deer camp, we all have at least one have thing in common: the magic of opening day. Even when you've seen more than 40 of them (and that's just in my home state), the wonder and possibilities make a person feel young again. Yes, there's all the nice stuff that we all value about opening day. The camaraderie of deer camp. Hunting with friends and family. Turning the page on another year. Building happy memories. But let's be honest. There's another reason you're here: to kill a deer. And if that truly is your goal, then opening day is the day of the season to do it. Statistically speaking, an overwhelming proportion of any gun season's kill happens on the first day. Strategically speaking, opening day is your best all-out bet. More deer are in the in the woods than at any other time of season. They haven't been heavily pressured yet. You've got the stamina and fresh attitude to hunt full-bore for the whole day. Opening day success hinges on three simple factors: Being fully prepared with your gear; scouting hard and creating the right setup; and hunting with an organized plan and steadfast purpose. Turn to this checklist for opening day success this year. There's no excuse for not sighting in. Whether your rifle or slug gun is “off” and you zero back in, or you take one shot and discover all is good, the confidence that sighting-in creates will translate into opening-day success when that shot opportunity presents itself. If you miss because you didn't sight in, you get what you deserve. Start early by building, keeping and updating a packing list. I have a friend who keeps his list on his computer for year-to-year fine-tuning and editing. Whether you go electronic or with paper, do not rely on memory; you'll forget something. I keep a sidebar list for any shopping needs I come across, so one efficient trip can be made. Ammunition. Hand warmers. That extra pair of gloves. Deer scent. A new jacket. Better boots. Thermal socks. A great hat. As you build your packing list, the shopping needs add up. Get out and do it early to avoid last-minute rushes (when everybody else does their shopping), and allow some shipping time if you order online. You're going to stay out all day. Put together a good layering plan with a sweat-wicking base layer, insulating middle layer(s), and a warm/soft/quiet outer layer. Take care of your neck! You already know enough to wear a good hat, but take care of that neck area too. A neck gaiter is perfect for holding heat in. Put the gaiter on only when you reach your stand and get settled. A happy hunter stays out all day and shoots deer. Don't hit the woods without water or food. Getting dehydrated (which happens fast in the cold as you respirate the chilled air) is the sure way to a headache and misery. Pack a lunch – a good one, not crap such as potato chips and candy bars. Example: ham sandwich on whole-grain bread, apple (good moisture in it), granola bars or cookies, and water. A thermos of coffee or hot chocolate isn't great for hydration, but it goes a long way toward warming you up and brightening a long wait. Make a plan for your opening day setup. That means getting out and scouting either on a dedicated scouting outing, during your bowhunting, or while small game hunting. Concentrate on escape travel funnels, as well as bedding areas and thickets themselves. Sacrilege, you say? 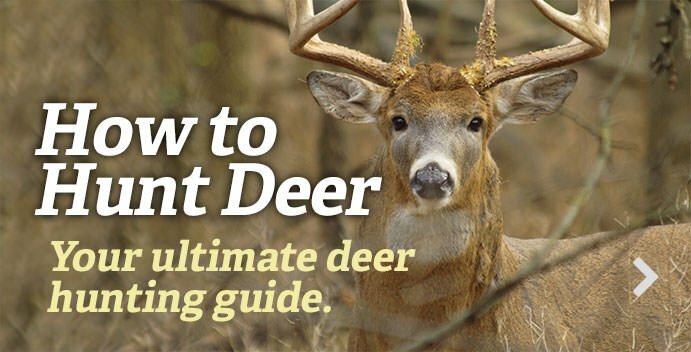 You're here to kill a deer, and opening day whitetails are going to be eluding other hunters and heading to their favorite whitetail hidey-holes. That's where you need to be waiting. The worst thing you can do on opening day is blow out the very deer you want to hunt before first light, by being lazy or dumb about how you approach your setup spot. For instance, don't walk through the very fields or clear-cuts where whitetails will be feeding. Instead, make a circuit, or come in the “back door” by another route. Even wait until shooting light to slip into your stand. It's worth the extra effort. If you hunt big woods or hill country where it's easy to get a little mixed up in the dark, it's worth the prework of really marking your route to your opening-day stand. There's nothing worse than watching daylight emerge around you, and the first shots ring out, as you cast about looking for your stand. Use reflective tacks, or small, bright biodegradable flagging tapes, to assure you get in quickly and quietly. A GPS unit will do the job too, but I like the old-fashioned assurance of a physically marked route. Getting into your stand like a ghost, and then waiting like you're not there, is the key to opening-day hunting success. Test your stand for creaks and groans, and work them out on your setup trip. Wrap metal or other loud surfaces (where you gun barrel might clunk) with moleskin or soft fabric. Rake a path the last 50 yards to your stand for an ultra-quiet final approach. It's important to note that most states log anywhere from a quarter to half of the total gun harvest on opening day. So be there. But don't overlook the rest of the season, though. Prime days will follow the first. Plan everything out minute-by-minute to establish a wake-up time for your alarm clock. Then get up a half-hour earlier. What's a half-hour on opening day? You're probably not sleeping much anyway. It's better to be a little early than late. And this time gives you a cushion for unexpected events or delays before shooting light. Do not leave your well-planned stand site after a couple hours to cast about looking for deer or to head in for lunch. Stay put, all day. This is why you bring water and a sandwich. This is why you dress for warmth and plan for comfort. ANY time is good time to shoot an opening-day deer. I've shot whitetails a minute into the open season, a half-hour in, an hour in, at midmorning and high noon, midafternoon, and in shooting light's final moments. It's hard to maintain your attitude after the first hour or two. But do not despair! The rest of the day is just as good, as disturbed whitetails filter back to their home ranges, or other hunters move them. This is why you hunt travel funnels and escape areas. These spots get better as the day wears on. The final key to opening day success is deciding beforehand what you will be happy shooting this day. Then you can hunt without indecision or regrets. Are you happy with an antlerless deer? Any buck? A buck of a certain size? My personal motto is to take the first legal deer I can – because there are never any guarantees after that first opportunity presents itself. So decide: What's your standard? Know it so you don't end the day regretting taking a shot, passing a shot or standing there frozen in indecision. Editor's Note: This was originally published November 14, 2012.